Rollin' down the river with Proud Mary and her krazy krewe! 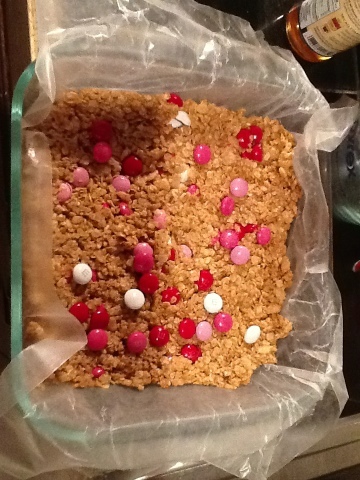 : No Bake Granola Bars! Noah is obsessed with granola bars. He asks to eat one about one a day and most recently had the Fiber One kids which were very yummy. I decided to be adventerous and make a batch of granola bars myself. I looked online for recipes and I found this one that caught my eye from Two Peas and Their Pod. The recipe is no bake and had 2 of Noah's favorite things: peanut butter and chocolate chips! I didn't have chocolate chips on hand so I opted to use valentine M&Ms. The recipe was very simple and the bars are delicious! I didn't add the pretzels but I will give that a try next time. I'm happy to find a good basic recipe that I can add things to maybe some diced fruit? Marshmellows? In a day half of the 8x8 dish is already gone! Yummy. These are officially Noah approved!